This post is sponsored by Pro Plan BRIGHT MIND and the BlogPaws® Pet Influencer Network. I am being compensated for helping enrich the lives of senior dogs, but I only share information relevant to my life and think my readers would enjoy. Pro Plan BRIGHT MIND is not responsible for the content of this article. Nick and I always joke about Roxy never being able to live in the city because she's a mountain dog, always and forever. Did you know, around age seven, the glucose metabolism in a dog’s brain begins to change, which can affect memory, learning, awareness or decision making. Truth be told girlfriend is going to be 7 years old [49 in dog years] in June. 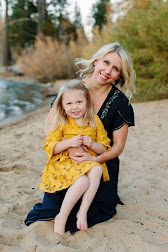 Over the last year we've started noticing small changes and started taking the steps to ensure Roxy girl can charge up mountain peaks for many more years. First things first, food. Not only did we switch brands we switched to Adult 7+ food. When researching brands to fit Roxy's nutrition and senior dog needs we came across Purina Pro Plan® BRIGHT MIND Adult. We wanted a food containing enhanced botanical oils to promote memory, attention and trainability. Yes, you can teach an old dog new tricks. 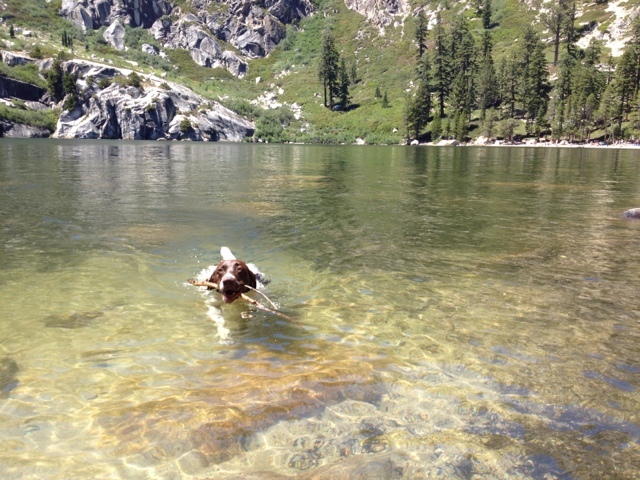 Roxy is very active 70 lb german shorthaired pointer who loves swimming, hiking and hanging out with the family. With the resent addition of baby Emerson we wanted to make sure we're caring for our first baby's health as she begins to age. Adding a baby into the mix was a big adjustment for Roxy, since switching to Purina Pro Plan BRIGHT MIND Adult 7+ we've noticed her warming up to the change, aside from when Emerson has food. 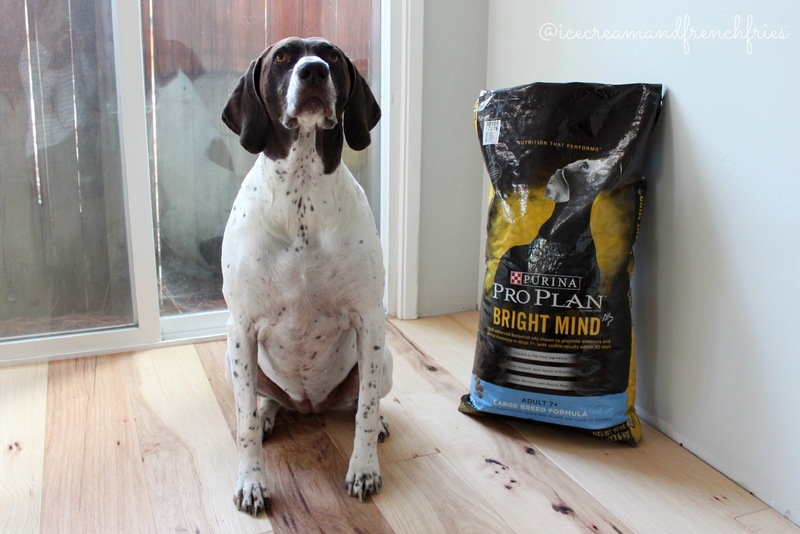 Purina Pro Plan® BRIGHT MIND Adult 7+® is available at PetSmart and can help your senior dog! 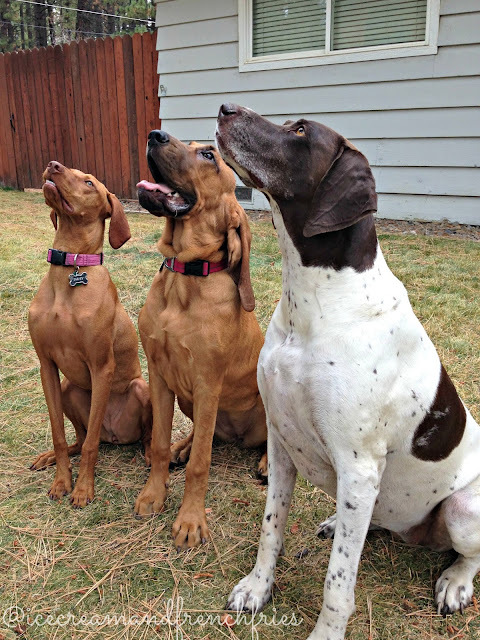 Since eating Purina Pro Plan® BRIGHT MIND Adult we've noticed Roxy is more on point around her younger dog friends. She still dominates, but she's more likely to chase the ball. I mean look at that focus. Roxy girl didn't mind the food switch up and actually eats right after being fed. Over the last 6 [ish] months I noticed she wouldn't eat her morning feeding until around noon or would sit next to a full bowl and look at us, then the bowl. Apparently it was her way of saying she was ready for a change. Please note... 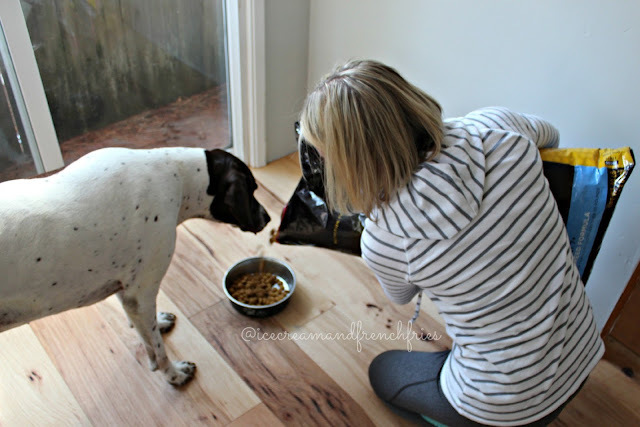 Although I'm pouring the food directly into Roxy's bowl make sure when transitioning your dog to Purina Pro Plan BRIGHT MIND Adult 7+ from his/her current food to follow the instructions on the back of the package. Like many families our dog Roxy is an important part of the family . We have to remember to take care of aging pet needs so they can continue to live healthy and active lifes. Alright, she's giving me the look I'm off to walk the dog. Purina Pro Plan BRIGHT MIND Adult 7+ formulas contain enhanced botanical oils shown to promote alertness and mental sharpness in dogs seven and older with visible results within 30 days. Aww my dog is going to be 7 years old as well next year. Love the photo of the three dogs all looking up! SO cute! Good to know about Purina Pro Plan's Bright Mind line. I wonder if they have grain-free options my sweet dog can enjoy? I'll check them out - thanks! They do offer a few different options so you never know. Riley will be 9 in March and he's as smart as ever. I think he is smarter than I am!